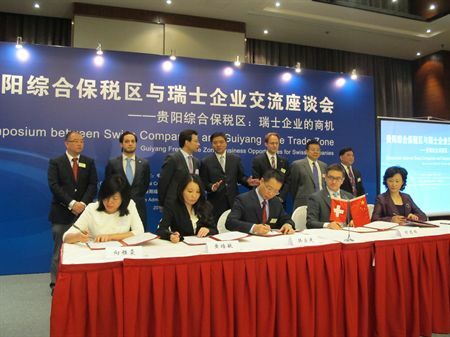 The signing ceremony took place on the morning of April 24, 2014 in Beijing at the Symposium between Guiyang Free Trade Zone and Swiss Companies. This partnership will strengthen economic and trade cooperation with Swiss companies, Guiyang municipal party committee and the municipal government held exchange forum between Guiyang integrated free trade zones with the Swiss companies on the morning of April 24, 2014 in Beijing. During this Signing Ceremony were presents, The Secretary General of the Swiss Chamber in China and President of Eurohold China, Pauline Houl, His Excellence The Ambassador of Switzerland in China Jean-Jacques de Dardel and the Secretary of the CPC Guiyang Municipal Committee, Mr Chen Gang. Commercial counsellor's office director, Wang Shunqing, and Deputy director from the department of European affairs of ministry, Zhang Hanlin, and Deputy secretary-general of Guizhou government, Nie Xuesong and Ji Ningfeng leadership members of Guiyang also attended the event. Guiyang Television and 25 chinese medias have reported this event and talked on the signature of strategic cooperation with Eurohold China. The Ambassador of Switzerland in China H.E. Jean-Jacques de Dardel pointed that the reform and development of China was impressive and that the Sino-Swiss Free Trade Agreement strengthened the Sino-Swiss bilateral trade development and relations. Secretary General of Swiss Chamber in China (Pauline Houl) and few companies of which Eurohold China addressed the audience and were interviewed by Guiyang TV. During the conference, Guiyang Free Trade Zone signed strategic cooperation agreement respectively with Swiss Chinese Chamber of Commerce, PWC, Eurohold China, and Eurasian. Over 9 billion Rmb investments have been signed to strengthen the trade cooperation between Swiss companies and Guiyang integrated free trade zone. Switzerland and Guiyang reached comprehensive cooperation intention during Guiyang international forum in 2013. Since then, bilateral cooperation scope is expanding and deepening. In order to strengthen cooperation with Switzerland, Guiyang free trade zone will focus on creating “Sino-Swiss Free Trade Economic & Trade Cooperation Park”. The Sino-Swiss Trade Cooperation Park is located in the eastern part of Guiyang integrated free trade zone, with the Area of 10,000 square meters. Lying in the natural river systems, wetlands, and deep forest, and with the diversified services such as customs bond, finance, scientific research, and ecological supporting, it will become a multi-functional park with the characteristics of international, modern, informationalized, and industrialized. The park is planned to be built into a multi-functional area by focusing in ecological agriculture, high precision manufacturing, financial services, science, education, culture, health care, cultural innovation, tourism, exhibition, and equity transaction. The commodity exhibition center and planning exhibition hall is expected to open at 2014 Guiyang international forum in July. The Secretary of the CPC Guiyang Municipal Committee, Mr Chen Gang pointed out that Guiyang free trade zone is a platform to hold various promotional activities for Swiss companies and has a long-term strategic significant cooperation. Swiss-Guizhou cooperation is bound to open a new chapter and enhance the level of Guiyang economy greatly, promote the upgrading of the industry. Guizhou, Guiyang and Switzerland have a lot in common, especially the fresh air, good ecological environment, strong attraction is for new and high technology, modern manufacturing and modern service industry. Hope the two sides to strengthen exchanges and cooperation in all aspects achieving coordinated development of "gold medal" through concerted effort, just like the famous Swiss Roger Federer and athletes Varin Card’s collaboration earned them men's tennis doubles gold medal in 2008 Beijing Olympic Games.